The constables, head constables and assistant sub-inspectors who were “knighted” were given a shield and a set of home appliances. Actress Sharmila Mandre with the award winners in Bangalore on Wednesday. A police constable who nabbed a killer after he escaped from jail last year, and an assistant sub inspector instrumental in busting a gang that stole 23 cars in southeast Bangalore were among 21 policemen “knighted” at a special event here on Wednesday. 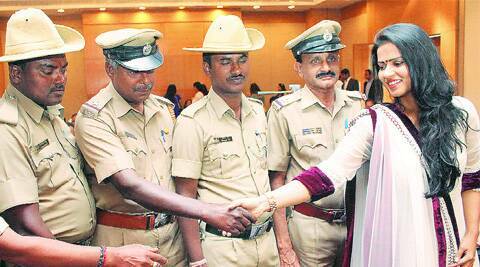 Those felicitated at the event, Knights in Khaki, organised by the Round Table India and Ladies Circle India, include constable P M Ashraf, who helped arrest Jaishankar after he escaped from Parappana Agrahara jail in September, 2013. “It is the first time I have come out in my uniform; we have been with the special unit and have been trained to operate anonymously. The work is stressful and we are away from our families without a routine, time table or holiday. It is a rare occasion when our contribution is publicly acknowledged,” Ashraf said. Assistant sub inspector Sriram Reddy, attached to the Hulimavu police station, was also felicitated for busting the gang of car thieves. Bangalore police commissioner Raghavendra Auradkar said community support and recognition boosts the morale of grassroot level policemen. “Of course the police department is an organisation of paid professionals and they are not doing philanthropic service, but these men and women have a passion to contribute to society,” he said.